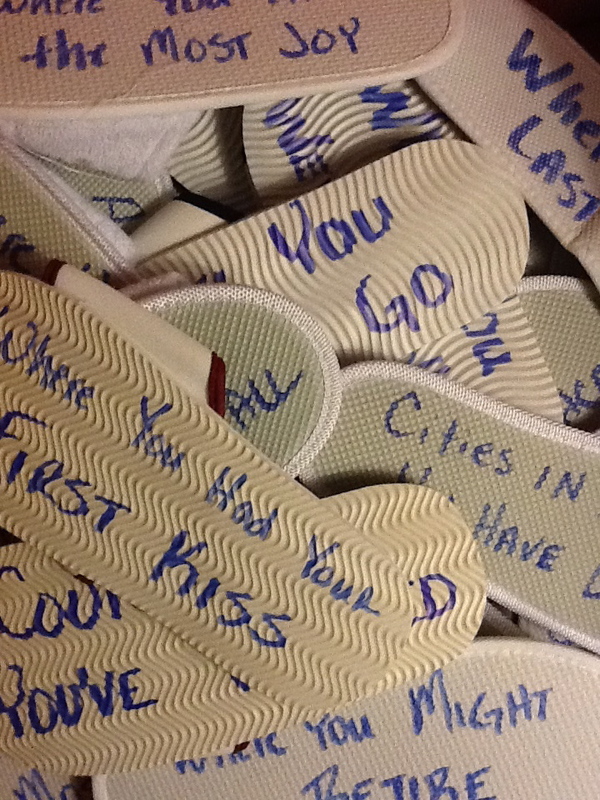 This icebreaker uses flip-flops, slippers or shoes to pair people up and have them describe a place they have been, want to go or where something significant happened. o Pairs of flip-flops, slippers or shoes (enough for each person in the group to get one shoe) NOTE: You want shoes on which you can write or stick tape on the soles. I’ve used the free slippers they give you in hotels and on airplanes, and they work well. Either mix the shoes up in a big pile somewhere in the room, or scatter them around making sure to keep the pairs separated. Description: Nebuchadnezzar’s armies invade Jerusalem and take away the best and brightest teenagers to Babylon to make them aides in the king’s court. Daniel and his friends choose to honor God by not eating food from the king’s table. Like Daniel and his friends, kids today will often be faced with circumstances that challenge their commitment to following the Lord. Christians are called to be in the world, but not of the world. This is a big lesson with lots of moving parts. Feel free to scale it down to suit your teaching style, available time or resources. Is what God wants to see from you. Water (enough to fill bottle almost ¾ full) and some extra in a separate container to use later in the lesson. Vegetable oil (enough to fill bottle ¼ full) in a separate container. A copy of the answers for the Game Show. These are at the end of this document. Cardboard boxes or a table decorated to look like three contestant booths on a Jeopardy-type game show. Three sheets of flipchart paper (one for each contestant booth). Thread the yarn or string through each hole, and tie it off to make a lanyard to go around the kids’ heads. Pour water into bottle, and drop in several drops of food coloring. Put the lid on the bottle, and shake thoroughly to mix the coloring throughout. Get two volunteers to act as your waiters. Have them dress in costume and be ready to appear with one of the platters (each of them) when you call on them. Prepare both of your platters – one should be piled high with junk food, the other with vegetables, and then covered. Load the PowerPoint slides for “In But Not Of – Charts and Game Show,” and black the screen by pressing “b” on your keyboard while you are in Slide Show View. Create and decorate your three contestant booths. Tape a sheet of flipchart paper to the front of each booth. Position these somewhere in the room where they will be in front of the kids but also able to see the projection screen. Hide the answer sheet in the booth that you will assign to your “Daniel” volunteer. You don’t want the other kids to be able to see it from where they are standing, but it has to be easy for “Daniel” to see without drawing attention to himself/herself. Select a “Daniel” volunteer (might be best to use another adult), and explain that you would like his/her help with a “game show.” Show him/her the booth and where you’ve hidden the answers. Tell him/her that you want them to get most or all questions right but that he/she shouldn’t allow anyone to know that he/she has the answers. Also see: http://wallbuilder.wordpress.com/2009/11/05/taking-a-stand/ for additional sermon illustrations. By stealing Israel’s smartest and most promising youth, Nebuchadnezzar kept Israel from growing stronger after he returned to Babylon. The Jews would have no strong leaders to lead them in battle against Babylon. “This was their first test in this new land. Would they eat the king’s food? The person who raises their hand the fastest is the one who gets to answer. If you get the question right, our scorekeeper will add the points for that question to your scoreboard. However, if you get the question wrong, the scorekeeper will subtract those points from your score. The winner will become my most trusted advisor, and the losers will become doggie treats for my attack dogs. If anyone has any questions, I will boil him in oil. Any questions? Good, I didn’t think there would be. It would be easy, after all. The king might do terrible things to them if they didn’t. King’s Secrets – 100 His subjects are a royal pain. King’s Future – 300 Da bunnies, da bunnies, Oh, I love da bunnies! King’s Future – 400 Da Persians, da Persians, Oh, I hate da Persians!